We’re on a mission to change the face of music therapy and turn it into a nationally recognized healthcare field, and that starts with our clients. We want to amaze our clients and their families in everything we do. 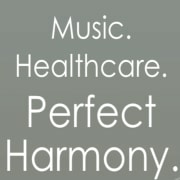 We’re leading the nation in billing insurance to cover music therapy services. We’re extremely picky with our therapists, hiring only the cream of the crop. We firmly believe in a team based, holistic approach to therapy and healthcare. Our beautiful clinic space is fully equipped to serve our clients’ needs. We’re deeply rooted in the Atlanta special needs and healthcare community. We continually invest in continuing education for our therapists. The George Center was established in Roswell, GA, in 2010. Since our beginnings, we have expanded to serve clients in the Metro-Atlanta area and beyond! We serve clients in a variety of special needs and healthcare settings, utilizing music to help our clients succeed and achieve their goals. Programs include group and individual music therapy services, our "Any Dream Will Do!" Performing Arts class, Intergenerational Rock Band, and our award-winning intergenerational program, The Giving Tree, to name a few. Would you recommend The George Center for Music Therapy?